1. If you are injured get medical help-Call 911 wait for the police and an ambulance. It’s best to remain at the scene of an accident. 2. When the police arrive tell them what happened- Do not discuss what happened with anyone else. 3. Take down the names, addresses and phone numbers of any witnesses to the accident-The police do not always include all witnesses in the police report. 4. Take photographs of your injuries, the damage to the automobile in the case of a motor vehicle accident, and the scene of the accident as soon after the accident as you can – A good picture is worth a thousand words. 5. Don’t sign any documents or releases of information unless you are advised to do so by your attorney- You may waive important legal rights without knowing it. 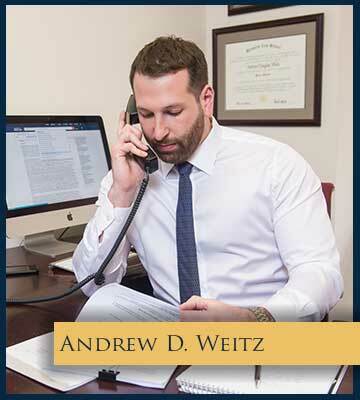 THEN CALL BERKOWITZ & WEITZ, P.C. and GET THE HELP YOU NEED!